Great deal with plenty fitted into the day ,a good way to see a few of the site in Paris. Fantastic guide on the tour day and a fab 5 course meal on the Seine trip . Let me start by saying: they will not answer their phone. As you’ll see in other reviews, this is an ongoing issue that they refuse to fix. I was scheduled for this $300 tour with a meeting time of 5:45pm at their headquarters. On the way to the meeting spot, my Uber was involved in a car accident. So at 5:00pm I started calling the number provided to let them know I would be late and to explore other meeting options. For 45 minutes I called them and they never picked up for the phone. At 5:50pm, I made it to their headquarters to see the staff standing and laughing in the back room. I explained who I was and asked why they hadn’t answered the phone. I lie to you not, the man looked at his watch and said “what difference would it have made if we answered the phone or not? We wouldn’t have waited for you, the time to leave was 5 minutes ago!” Composing myself from the shock, I explained that he could have told me where I could meet them at the Eiffel Tower instead of me taking an Uber here, now needing to take another Uber there! As I was mid-sentence talking to him, he began to shake his head and picked up the phone to call the tour guide. He told me she would meet me no later than 6:45pm (dinner started at 7:00pm) at Kiosk 58 inside the ground level of the Eiffel Tower and that my $300 tour was non-refundable. Instead of complaining with a manager, I just took my identification papers and left. When I finally made it to the Kiosk 58 at 6:33pm (after flying through traffic in my third Uber), I was informed by the Kiosk attendant that the tour guide had already left me. On top of her leaving before the said meeting time, she’d also taken my ticket and there was no way for me to get to the restaurant. As the lady in the Kiosk explained this to me, I asked her if she could call her as it’s not 6:45pm and she should she should still be here. She said, (and I quote) “I’m not calling her, but you can call the company to see where she is”. I informed her that I was in this mess because they DON’T answer the phone there and I would really appreciate if she helped me out. She reluctantly, called her on my behalf. As she was on the phone with the guide (assumingly) explaining that she’d taken my ticket and I was at the Kiosk waiting on her, she looked up to tell me she would come down to get me. Before she could hang up the phone, I said excuse me and interjected to ask her to ask the guide how long before she made it back down (I wanted to take a few pictures)? Before I could finish my sentence, I lie to you not, she closed the sliding glass window in my face. I couldn’t and still can’t believe it. When she finished on the phone, she opened the glass window and looked at me and “how can I help you, I told you she was going to come down and get you”. If the tour was refundable, I would have walked off and just got my $300 back. I told her that I wanted her to ask the guide when she was coming down so I can go take pictures since I would be waiting. I asked her if she could call her back to see how long he would be. She said, “I just called my colleague once for you, I’m not calling her back.” If we were in America y’all.... I said to her, again, I want to take pictures, will you please call her back. She blatantly refused and told me that she would NOT point me out to the guide if I walked away. We went back and forth a little bit, but I retreated because I became frustrated and I didn’t want to get kicked out, lose my $300, not make it to dinner, and/or go to jail in France. I calmly walked away and waited about 10 minutes for a colleague of the guide to come down. Of course she nor my actual guide knew the name of the lady in the Kiosk or the man at the office. Dinner had already started by the time I arrived, but the restaurant staff was really accommodating and kind. I give two stars because the rest of the evening went well: the boat tour was beautiful and Moulin Rouge was magnificent. We had dinner at the Eiffel Tower and it was beautiful, it was my fiancé’s birthday and they added a candle to his desert and sang happy birthday. The staff from the guide to waiting staff at dinner were fabulous, unfortunately the show is early through winter so we couldn’t do the 1 hour cruise and headed straight to the moulin rouge, the show is epic and shouldn’t be missed on a visit to Paris. The whole trip from start to finish was an utter delight. I highly recommend the trip. As a birthday surprise it has to go down as one of the best. This was an amazing experience! Highly recommend. Seamless, well organized. Loved being dropped off at our hotel after a long evening. You can book all three events separately and use Uber to save a lot of money!! After walking from where the bus drops you off (about a block away) from the Eiffel Tower; we waited in line for dinner on a very cold and windy evening. We were under the impression we had priority access due to the scheduled dinner, cruise, and show. Dinner was good but it was very rushed due to the wait outside before entering the tower for dinner. The elevators are very slow so our group had to walk down the stairs to allow enough time to walk to the river where we boarded the cruise. Trust me! None of the above is fun to do at night in high heels. Upon boarding the cruise, we were followed by a group of at least 40+ teenagers that hand no supervision or consideration for other passengers. It turned a evening cruise on the seine river into a wild night out on the town for the large group of obnoxiously, rude teenagers. Every time the boat went under a bridge they would all scream as a group until the boat was fully out from under the bridge. We could not hear any of the history regarding the sites. Their behavior was not corrected by anyone from the cruise or Viator. While speaking with other passengers that were not apart of our group and who were equally upset we found out the cruise was only 17.50 euro per person without the package. That could explain the group of teenagers with the bad behavior. We were most disappointed in the cruise as this was a very special trip to Paris and we were celebrating a very special birthday evening for my daughter. Waiting in the cold, the rushed dinner to the staircase in heels was not a good start to the evening. The cruise experience was the icing on the cake! I can say the bus was clean and the transportation part was well organized. 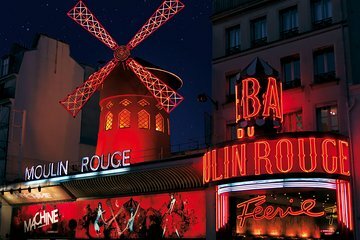 Moulin Rouge was a fantastic show and a must see during your visit to Paris. Although it didn't look like there would be a bad seat in the house; our seats were great and I believe the theater has an agreement with Viator to offer the better seats. My final thoughts: Way too rushed for three events in one evening. Too much waiting and walking when I paid over a 1,000.00 for 3 people! My husband and I really enjoyed this, it was a great finish to our day/evening. The organisation was great, the meal good, I am coeliac and they catered for me, dessert wasn't gluten free, but that's okay my husband enjoyed the extra dessert. The Eiffel Tower is just magnificent and to see it during the day and then actually visit in the evening was cool. The Moulin Rouge show was our highlight, it was the late show and I think it was enough to make the night enjoyable and not too long, with the included champagne which was so yum, we wanted more, but it was quite hard to get the wait-staffs' attention. We would definitely go to another night. It would have been great to have had some free time to just have a wee wander around he Moulin Rouge area - definitely something we will do on another trip. The Seine river cruise was nice and good to get a different perspective of Paris from the river, we probably wouldn't the river cruise, but we will definitely return to Paris. 5 days in Paris, 3 when you include 2 day trips was just not enough for us. We really enjoyed this tour. My friend and I are here from the USA and don't know the French language at all. We really appreciated how well organized and friendly our leaders were. We got to skip lines and get into the venues quickly. Highly recommended. My husband and I did this tour and we had an amazing time. We enjoyed a delicious dinner in the Eiffel Tower, which had great views, and then went on the cruise to see the city at sun set. At the end of the cruise, we were lucky enough to get to see the Eiffel Tower light up. The show at Moulin Rouge was a blast, with bright colors, singing, and dancing. I would recommend this to couples looking for a fun night our in Paris.